Kick off your visit on the 17th (Sun): experience rural life at Ounaskievari Reindeer Farm, then ski along the peaceful trails at Pallas-Yllastunturi National Park, and then experience rural life at Santa"s Cottage & Pet Farm. On your second day here, look for gifts at Elan Ski Shop & Rental, get a dose of the wild on a nature and wildlife tour, and then don't miss a visit to Ounasjoki - River for activities. To see other places to visit, photos, ratings, and tourist information, read our Levi planner . Amsterdam, The Netherlands to Levi is an approximately 9-hour flight. You can also drive. The time zone difference when traveling from Amsterdam to Levi is 1 hour. Plan for cooler temperatures traveling from Amsterdam in February, with highs in Levi at -5°C and lows at -12°C. Finish your sightseeing early on the 18th (Mon) so you can drive to Luosto. Start off your visit on the 19th (Tue): admire all the interesting features of Amethyst Mine Lapland and then look for all kinds of wild species at Kopara Reindeer Park. For reviews, photos, where to stay, and tourist information, go to the Luosto vacation site . Traveling by car from Levi to Luosto takes 2.5 hours. Alternatively, you can take a bus. Expect a daytime high around -5°C in February, and nighttime lows around -13°C. Finish your sightseeing early on the 19th (Tue) to allow enough time to travel to Salla. Salla is a municipality of Finland, located in Lapland. 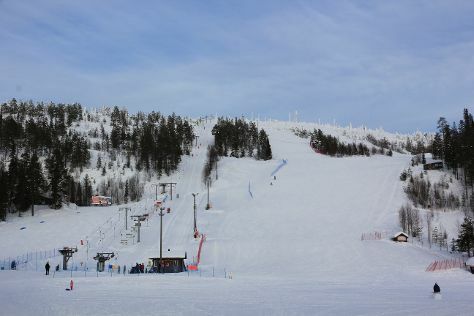 Kick off your visit on the 20th (Wed): get engrossed in the history at Salla Museum of War & Reconstruction and then fly down the slopes at Salla Ski Resort. To find more things to do, photos, other places to visit, and other tourist information, read Salla trip planner . Drive from Luosto to Salla in 2 hours. 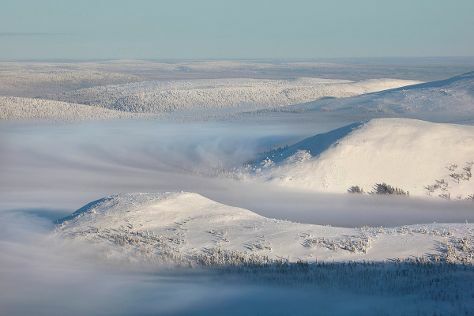 In February in Salla, expect temperatures between -6°C during the day and -13°C at night. Finish your sightseeing early on the 20th (Wed) so you can travel to Rovaniemi. Start off your visit on the 21st (Thu): snap pictures at Lumberjack's Candle Bridge, then fly down the slopes at Ounasvaaran Hiihtokeskus Oy, and then try your luck at Feel Vegas - Club Rovaniemi. Here are some ideas for day two: examine the collection at Christmas House Santa, experience the excitement of Feelapland, and then look for gifts at Your Piece Of Finland. To find other places to visit, more things to do, ratings, and tourist information, use the Rovaniemi tour planning app . Traveling by car from Salla to Rovaniemi takes 2 hours. In February, daily temperatures in Rovaniemi can reach -6°C, while at night they dip to -11°C. Wrap up your sightseeing on the 22nd (Fri) early enough to travel back home.